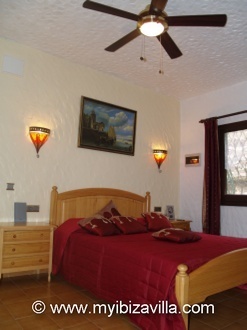 Your Spain villa to rent has 7 beds in 3 bedrooms. 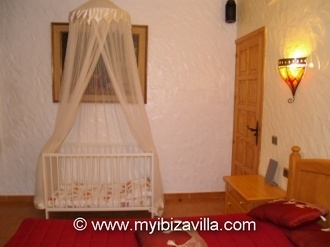 Bedrooms of your Spain villa in Ibiza. 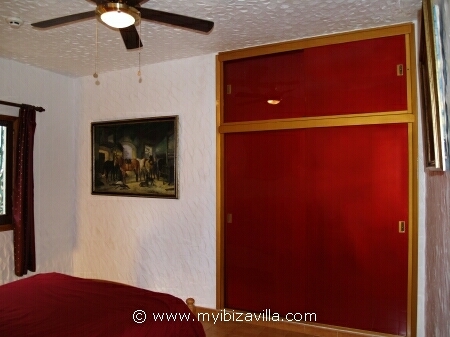 This double/twin room of your Spain villa is peaceful inspired by its colors. Cool down after a hot day/night� under the ceiling fan. built-in wardrobes of this Exotic bedroom of the Spain villa. Here is also an electric iron and ironing-board stored. On request we can transform this double bed in to 2 single beds. These beds of the Exotic room are equipped with a Lattoflex (slatted bed) base divided into 3 comfort zones, these adjust to your body weight and increase the suppleness of the mattress. The upper part of the Lattoflex base is adjustable to provide just the right amount of support for your body. The new special latex mattresses have 5 different comfort zones that provide posture support where it is needed and at the same time the relieve pressure on shoulders and hips. Pressure relieving latex contours to your body, enabling you to relax more fully and improving circulation to both muscles and skin. The flexibility of this latex mattresses effectively cushions your movements in bed providing truly soothing and more relaxed sleep even if your partner moves around. The open-cell material of these mattresses improves air circulation and allows moisture to evaporate naturally. The stunning views of this Spain villa, combined with the carefully designed interior, will soothe the body and brain, get you back in balance and boost up your energy. This is after all the purpose of a holiday. Relax in this double bedroom by the tunes of its own CD/music-system and atmospheric lighting. Large CD-collection to choose from in the living-room of the Ibiza vacation villa. built-in wardrobes of this Romantic bedroom of this Spain villa. 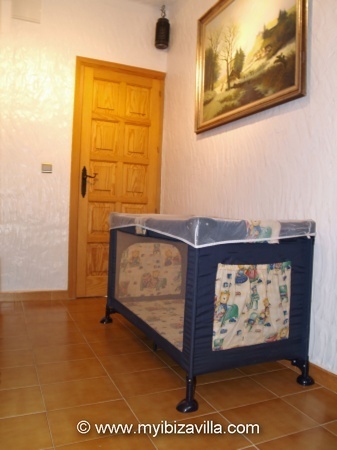 "If requested we can add this baby cot to this bedroom." 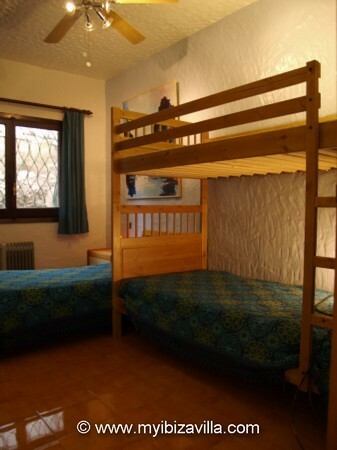 This 3 guest bedroom is most suitable for young people. It has a bunk bed and a single bed. On request; we can change this bedroom in to a double bedroom for a couple. "If requested we can add this blue baby cot to this bedroom." An electric mosquito repeller controlled by an adjustable timer to enter a mosquito-free room before you go to sleep. Ceiling fans " Westinghouse " bi-directional with 3 speed positions. Electric heating systems for the cooler winter months. Clean bed linen, bath towels & beach towels. This Spain villa has thick isolating walls and a double roof to keep the heat out in the hot summer months. 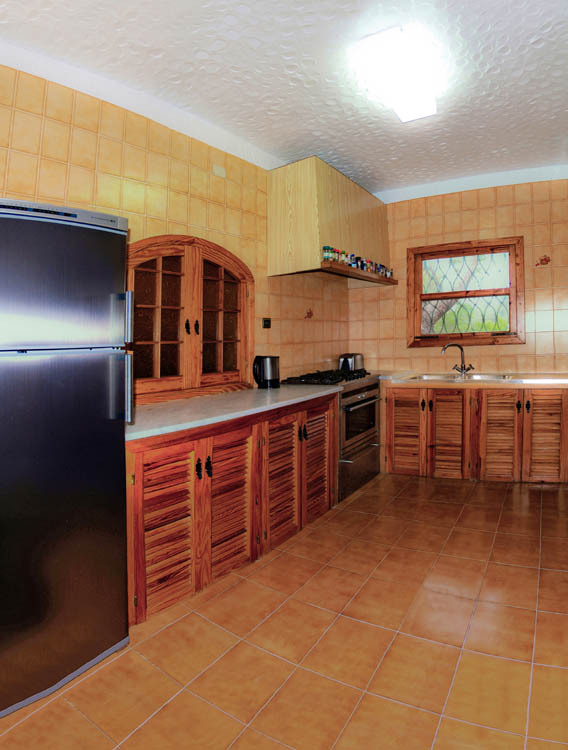 Take a look at the 3 bathrooms and the kitchen of this Spain villa to rent. 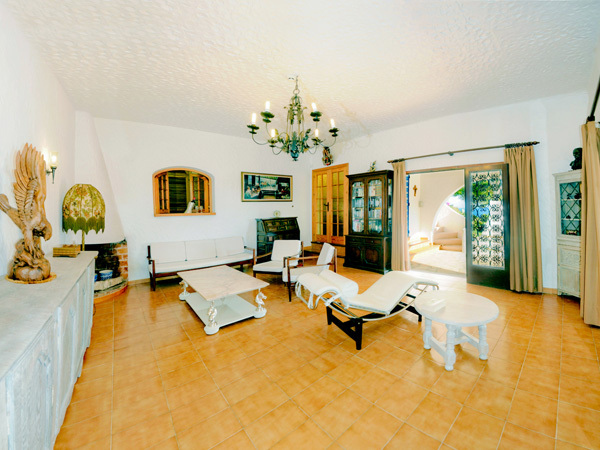 This entire website concerns just one privately owned Spain villa in Ibiza.